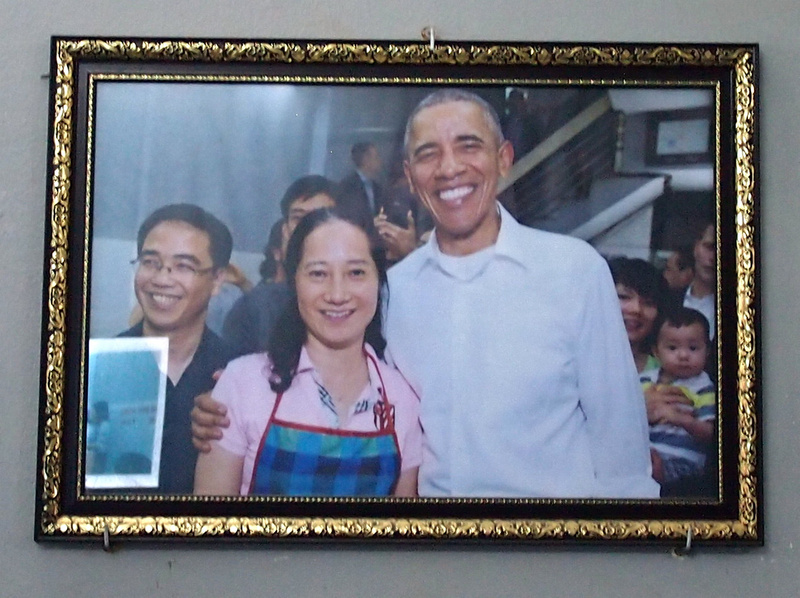 During the 2016 Presidential visit to Vietnam, Barack Obama went to a bun cha restaurant in Hanoi with Anthony Bourdain. If you didn’t see what happened check out the video and this interview with Bourdain on meeting Obama in Hanoi. 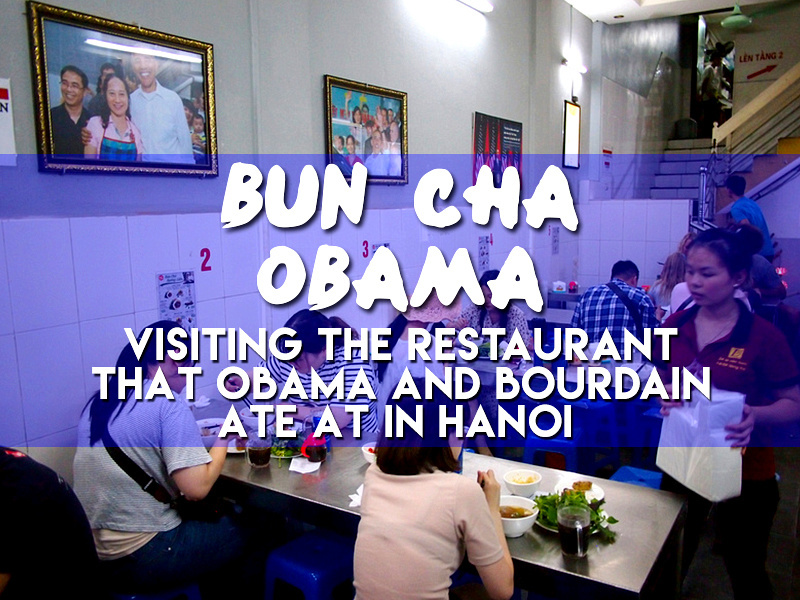 I wasn’t planning to visit Bun Cha Obama on my visit to Hanoi. 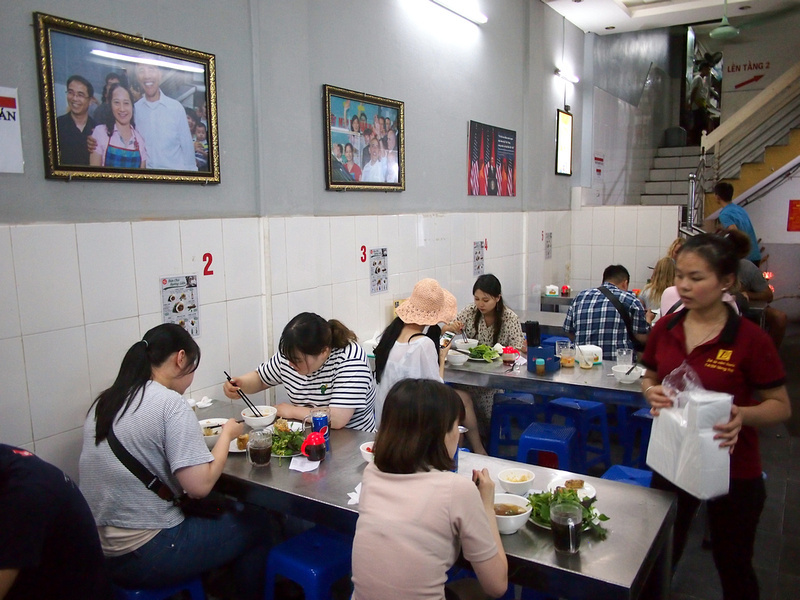 There is already a well-worn Bourdain trail in Saigon, where the places that Bourdain has visited have become tourist attractions. Not that there’s anything wrong with that. If it gets people away from the Intercontinental Buffet to try a bun bo hue from the Lunch Lady that Bourdain featured, then I’m all for it. 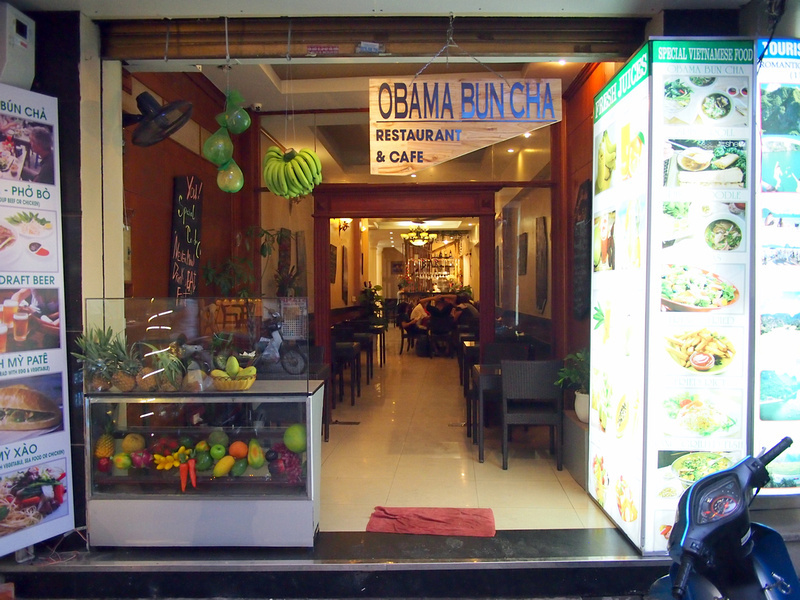 It wasn’t until I was wandering around the old quarter of Hanoi and saw a restaurant called “Obama Bun Cha” that I gave it a thought. This restaurant was not the actual place Bourdain took Obama, yet here they were cashing in on the association. 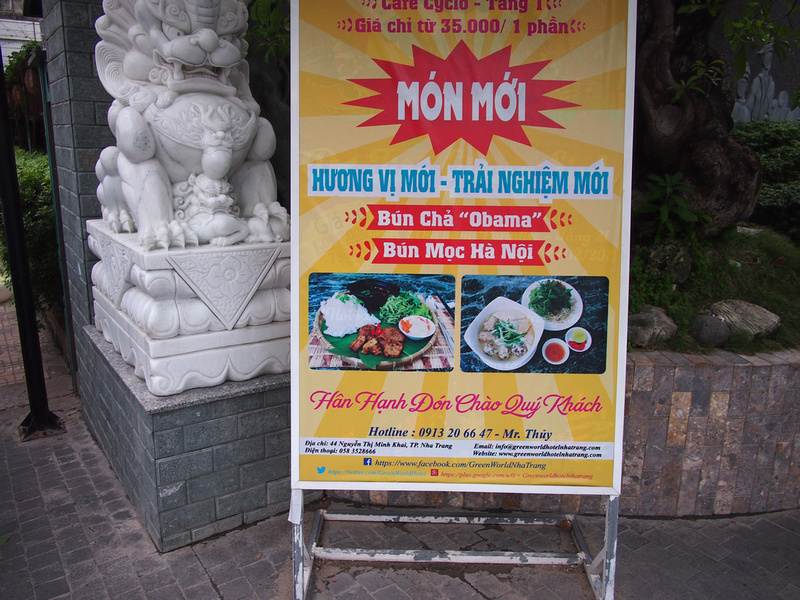 I saw a place in Nha Trang advertising Obama Bun Cha as well, and no doubt there are other places up and down the country doing the same thing. 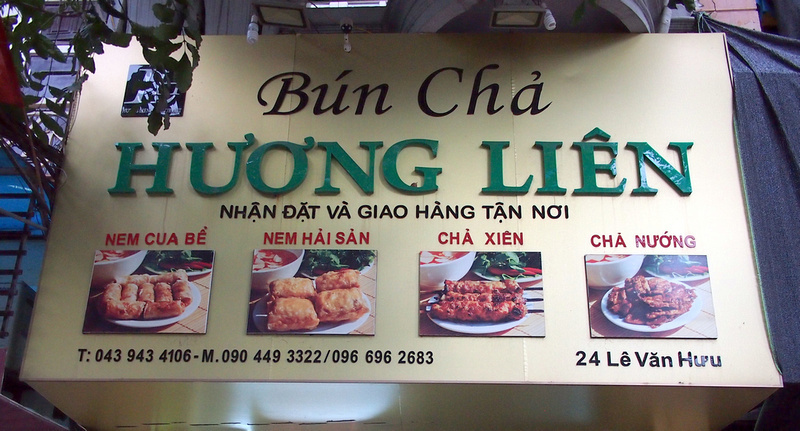 I started thinking that I wanted bun cha – a regular thought in Hanoi – so a walk to a new neighbourhood to have Bun Cha Obama seemed like a good activity. 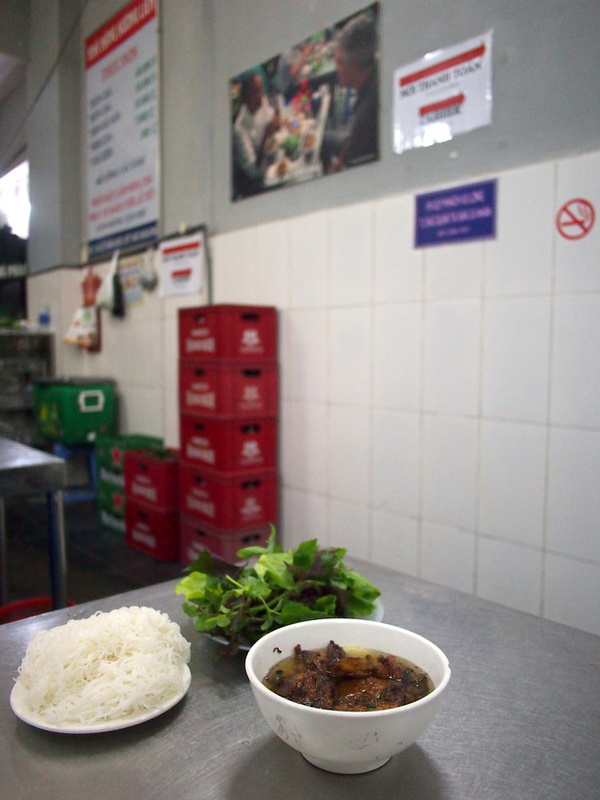 The restaurant is Bun Cha Huong Lien on 24 Le Van Huu. It’s south of the ancient city, still in old Hanoi but with wider streets. There are many embassies in this area, though don’t imagine it all to be villas and mansions as it’s still chaotic Hanoi. When I reached Le Van Huu street I started counting down the numbers to 24, and I felt self-conscious for being such a tourist. There is only one reason that a foreigner is walking down this street. I found the restaurant and I was surprised that there was no reference on the outside sign. Step inside though and the place is a virtual shrine for that fateful day, with pictures lining the walls. Even though most places serve bun cha for lunch I figured it will be open all hours now. I went at 5pm to get there before the evening rush. The place was busy with a mix of locals and foreigners. There was an American family sitting opposite me, with the dad pointing at the pictures to his two children. There were some Japanese and Korean tourists there, and then a large Vietnamese family group rolled in and went upstairs. 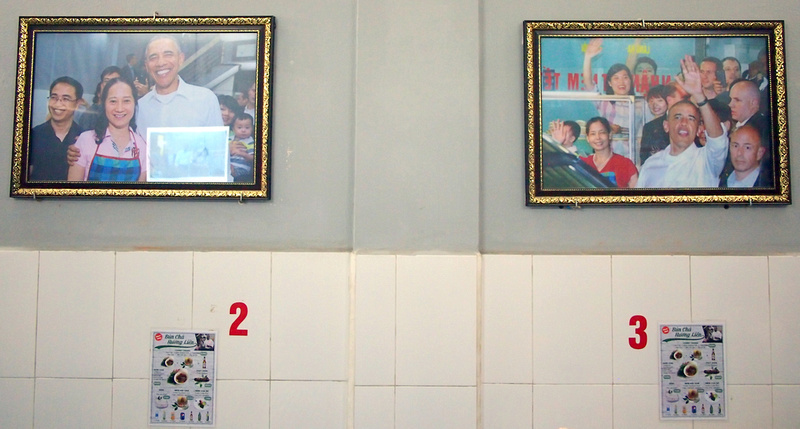 I wondered if the Vietnamese diners were regular visitors or tourists. While I was waiting for my bun cha I walked around the room to study the photos. This photo in particular simultaneously filled me with joy and sadness. Goddamn I miss No Drama Obama. I got my bun cha and I was happy with my decision to be a tourist and visit Bun Cha Huong Lien, or Bun Cha Obama as they are better known now. Very smart entrepreneurs over there … hope the bun cha was awesome! Oh wow, somehow missed that little place on our travels! How was the bun cha there? I have just returned from a trip to Balkans with a week stopover exploring Seoul so I was interested to read your take on it but cannot find hoe to access that story although I have been able to click on read your other posts.Any advice? Hi Blake, I’ve just returned from Seoul and I will have a couple of article posted this month. Stay tuned!